The "Wiener Moderne" or "Vienna Modernism" refers to the cultural and intellectual scene of Vienna approximately between 1890 and WWI (1914 to 1918). During this period, Vienna was among the biggest cities in Europe, the capital of an Empire with a population of 60 millions of various nations - and striving with economic and academic confidence. This is why these days are often glorified in Austria nowadays. During the "Moderne" era, intellectual schools of thought from all over the World merged more strongly than ever before: Vienna′s intelligentsia was influenced by counterparts from Germany, Italy, France, the UK, Scandinavia and the US. Nonetheless, Vienna is not only one intellectual hub of many, but succeeded in becoming a leading centre of thought and culture for this period. The Wiener Moderne was an era when artists started to oppose naturalism and supported "art for the sake of art"; Sigmund Freud and a circle of his friends established a new approach to human behaviour, according to which people′s actions were driven in part by subconscious forces; poets, composers and painters started to destruct formalities in each of their respective fields - in the various styles and ways that now constitute the schools of modern art. Key Features of Vienna′s "Golden Age"
All of this was done within the frame of the centralised metropolis Vienna as the capital of an Empire that was doomed to die soon - something every sane intellectual must have recognised at that time. The avant-garde was often directly influenced by foreign developments following long trips: Ludwig Wittgenstein′s father Karl - entrepreneur and art benefactor - had lived in the US for a while; so had the architect Adolf Loos, whose designs remained influenced by architecture from New York and Chicago throughout his life. The literature critique and writer Hermann Bahr commuted between Vienna and Berlin - and this believes were as restless as his life: Originally a pan-German nationalist and admirer of Germany′s chancellor Bismarck, he later turned Marxist, and - artistically - naturalist and later symbolist. 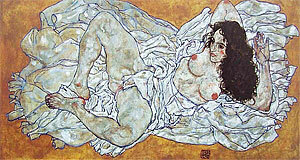 His late work is considered to be expressionist, at that time he had become a conservative and devote Catholic. Essential for the Wiener Moderne - and in my opinion key to understanding it - are two things: One is the conservative/reactionary, imperialistic, catholic, socially hierarchical atmosphere of the "Gründerzeit" ("founder′s age" - between approximately 1848 and 1900), which triggered much resistance and fuelled the development of modernist styles. The other is an obsession with the individual: From Freud′s understanding of the human behaviour, over the (early) language criticism of Ludwig Wittgenstein, the constructivism of the Wiener Kreis to the strictly anti-empiricist, individual-focused "Austrian School" of economics; they all made the perceptions and actions of individuals the core unit of their interest. Continue with: "Wiener Moderne - Part II"